This is the work thread for the Decimator class that I am currently working on. End goal is to get this sucker in game with brand spanking new models, animations, particles, skills, weapons, and new pet. That's going to take awhile, so this thread is here to show progress on the project. It's also a place to collect ideas, gather feedback from the community, etc. etc. So, feel free to comment and critique. The whole reason I'm doing this is so that people will play it and enjoy it, so it's up to you all to keep me honest and headed the right direction. Here is a paint-over concept for the character. As you can see, it's a steampunk robot (based off of the Warmachine series). He also will come with a robot sidekick pet. The actual in-game model will be of a lower quality due to polygon and texture constraints, but this gives you an idea of the look and feel I'm going for. The Decimator is a war machine from the distant past. The civilization that built it is now long gone, but this particular robot has survived countless wars and stood the test of time. It is the only remaining one of it's kind. Laser Beam: More pew pew, less QQ. 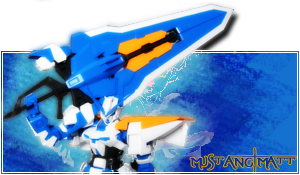 Shoots a continuous thin beam of energy that cuts through foes and hits multiple targets. 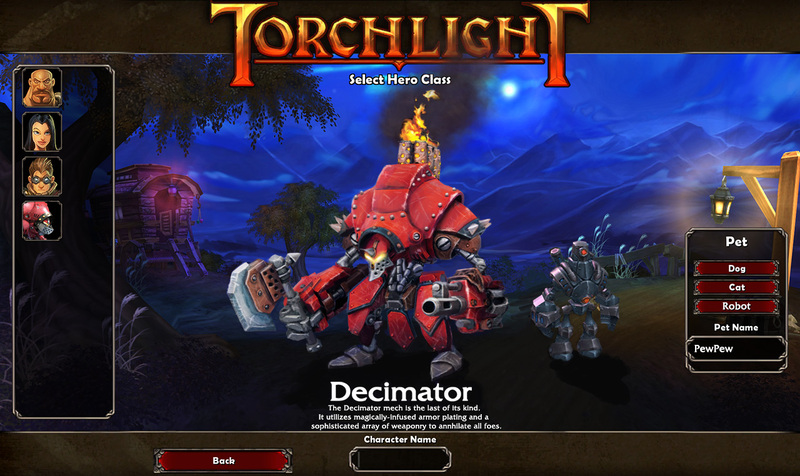 Torchlighter: Torch your enemies with an arc of flame from your very own "Torchlight the Flamethrower!" Kids love this one. Full Auto: Git some! Git some! Fire off a burst of fully automatic hot lead into your enemies. Jackhammer: This is my shotgun. It is my life. There are many like it, but this one is mine. A shotgun burst of explosive rounds that spreads in a wide arc." Missile Barrage: Shall we play a game? Unleash a barrage of heat-seeking missiles on your target. The Engineer is a diverse specialization focused on sneaky weaponry and summoning robots. Sentry Turret: Seven-six-two millimeter. Full. Metal. Jacket. A deployable turret with dual gatling guns. Repair Bot: What is your major malfunction? Summon this repair bot to fix you up quick. Attack Bots: Attack Bots: Roll Out! Summon an army of robot minions to do your bidding. Ricochet Grenade: First shalt thou take out the Holy Pin. Then shalt thou count to three, no more, no less. A grenade that richochets off of walls and explodes into smaller cluster bombs. Mines: Watch that first step. It's a doozy! Deployable land mines that explode based on enemy proximity. The Gladiator tree focuses on close quarters combat and melee attacks. This is for players who enjoy getting in close and dishing out and taking damage. Swing Arm: It don't mean a thing if it ain't got that Swing. A ball and chain fires from the Decimator's arm and swings around in a 360 arc. Causes heavy knockback. Saw Blades: The Decimator fires off lethal spinning Saw Blades at the targeted enemy. Single target. Ground Pound: 7.6 on the Richter scale. The Decimator pounds the ground with his mighty arms, causing large rock debris to fall from above. Chimney Shot: Smokes like a chimney. The smokestacks of the Decimator explode with energy, raining fire and ash on nearby enemies (AOE attack). Thanks for reading and please post your feedback! This looks awesome! I was a little disappointed when I actually started reading what you wrote and realized you're just getting started :oops: It will be a nice breathe of fresh air from the fairly "standard" classes everyone else is making (disclaimer: I'm one of at least three people making an Assassin class ). Hopefully we can pool the community resources and get this working. This is very promising ! I will definitely follow this thread ! I really like custom classes mods, I think they will create much variety in the gameplay. May I suggest that the skills from the "ballistic" tree should not have a very long range ? Your class seems pretty tough to kill, so I believe it should be "forced" to face the enemy up close, first with medium range skills such as the flamethrower or shotgun, and then melee to finish off the mobs that got through. This is just a suggestion, of course, but I think each class should have a weakness to balance its strenghts. very very nice.. haven't played as robotic killing machine in any ARPG I remember - looking forward to it. Though I have a question about loot - will different armors change the look of your machine - and I guess leather armor won't fit very much. Also weapons and so on - maybe you can design left arm in a way that current pistols can be equipped (make an arm in a way that it will hide the handle and only gun barrel will be visible ?). Great idea, and I love the skill descriptions. Definitely going to keep an eye on this. PM me when you start making a War40k Dreadnaught. The plan is to make new wardrobe of armor and weapon sets for the character. 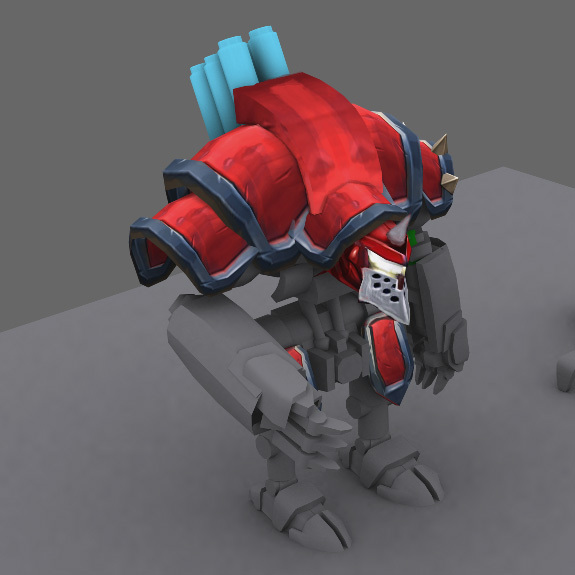 For example, when you equip new armor pieces it will swap out the armor shell of the mech. For weapons, when you equip a pistol or rifle, it will physically change the mech's arm (think of his arms as detachable attachment pieces). Make sure to give it a lot of steampunk feel! I'm loving this. I'm assuming you did all the artwork yourself? Very, very nice work. I'll be keeping my eye on this one for sure. This is a VERY cool concept...you've got a lot of work ahead of you, wish I had the skills to help. wow man you've got quite an imagination, now we got to see if you got the skills to make it a reality-- and so far, it looks promising. Utterly insane. I like it. this is totally bad ****, much respect. I somehow get the feeling that it wouldn't exactly be 100% doable (unless you are willing to devote a lot of time in it) to implement the artwork into the game though, do you have a back-up plan of making this new class with the robot model already available in the game files? Thanks. Yeah it's going to take some work for sure. As a backup plan I got my friend that's a pro animator willing to help get the anims done. That's the part that will be the hardest for me, I don't have much experience animating. So, we'll see, I may end up getting some help to finish it out. But, I definitely want to get it done and out to you all. I think it would be the slightest hint of irony having the kid that runs around town as a pet. Looks good. I think one of the skills should have a Warmech (FF1) reference in the description; that was the first thing I thought of when I saw it. I'm sure an AoE "everything instantly dies" skill would be unbalancing (just like it was in FF1), but maybe an AoE knockback would work. That'd be pretty funny. It'd be even better if the kid never shut up (overhead text, not voice). Gee, mister! You sure are awesome! Can you do that thing where you spin around and everything explodes? That was cool! This class concept is pure, undiluted win. Thanks for the positive comments everybody. Much appreciated. And once again i am ueber jellous of what talents people have. This model is fantastic. The head of the mech reminds me of the pet robot dog of the main character from septera core. Very nice work. have you thought of following this with some of the other Warmachine nations? I'd love to see something from Cygnar say.